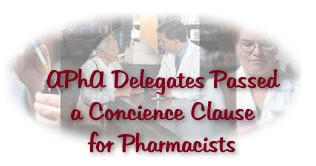 4/20/99: The Ohio Pharmacists Association adopted a Conscience Clause, at their meeting this past weekend, to protect concientiously objecting pharmacists. This resolution was passed by a vast majority of the delegates without debate. Atlantic City, NJ--Members of the New Jersey Pharmacists Association (NJPhA) overwhelming passed a pharmacist's conscience clause here on 2 July. The clause closely resembles the one passed in Miami Beach by the national group, American Pharmaceutical Association. The NJ resolution also carries the added urging of the group to have the CC included in the revision of the pharmacy practice act currently underway. The national hospital and clinic pharmacists association, ASHP, passed a less protective CC at their annual meeting in June in Baltimore. Several other states and national associations as well as legislative bodies are taking up the pharmacist's CC on their respective agendas. Currently, bills are pending in WI and KY. The Pennsylvania Pharmacists Assn. is taking up the CC this month as well after it was overwhelming endorsed by the Delaware Cty local chapter of PPA. * Pierre, SD--The new pharmacist's CC went into effect in South Dakota on 1 July without much fanfare or incident. No legal challenges have been made to the simple clause protecting pharmacists who refuse to participate in three specific situations, referring to abortion and assisted suicide. SD was the first state to pass a CC at the legislative level. Bills are pending in WI and KY. The CC has been passed by trade associations in LA (community and hospital groups), PR, CA and the province of Alberta. It has also been adopted nationally by APhA and ASHP. "1)APhA recognizes the individual pharmacist's right to exercise conscientious refusal and supports the establishment of systems to ensure patient access to legally prescribed therapy without compromising the pharmacist's right of conscientious refusal. 2)APhA shall appoint a council to serve as a resource for the profession in addressing and understanding ethical issues." This policy serves as a recommendation about the standard of pharmacy practice. It does not have the force of law. Prolife pharmacists view it as a step in the right direction. If the policy is generally accepted as a pharmacy standard, or is used as a model for legislation, pharmacists will no longer risk legal reprisals or loss of employment for refusing to participate in medical practices which they consider to be unethical. Bogomir Kuhar, of Pharmacists for Life International reported that the "Conscience Clause went on to victory in a smashing lopsided vote for our side!!" He said that the prolifers at the convention were surprised at the amount of support that they got. Maybe God is smiling on the decade or so that Bo has spent promoting a more all- encompassing conscience clause for pharmacists, as well as other prolife issues. My thanks goes to everyone who responded to the KMart story and the APhA story, and publicized it, and wrote letters and made phone calls. I'm convinced that your awareness, response and prayers had a great deal to do with this success. Karen L. Brauer M.S. R.Ph.